With the presence of a large pool of participants, the global environmental testing market is displaying a highly competitive business landscape, finds a new research report by Zion Market Research (ZMR). Bureau Veritas, Eurofins Scientific, Intertek Group PLC, R.J Hill Laboratories Ltd, AssureQuality, Romer Labs, AB Sciex, SGS S.A., and Agilent Technologies Inc are some of the key vendors of environmental testing across the world. These players across environmental testing market are focusing aggressively on innovation, as well as on including advanced technologies in their existing products. Over the coming years, they are also expected to take up partnerships and mergers and acquisitions as their key strategy for business development, states the environmental testing market study. Citing an instance, in October 2018, The Public schools in Robeson County in North Carolina across the U.S. were declared closed as a result of environmental testing. 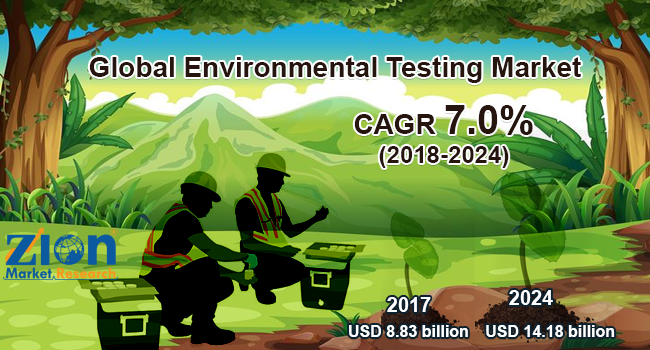 As estimated in this report, the global environmental testing market stood at US$ 8.83 billion in 2017. Witnessing a tremendous rise during the period from 2018 to 2024, the revenue in this environmental testing market is expected to reach US$ 14.18 billion by the end of the forecast period. “Growing incidences of health issues caused as a result of organic contamination are predicted to boost the growth of environmental testing market in the years ahead,” says the author of this environmental testing market study. Apart from this, other kind of contaminations such as residue, microbiological, heavy metals, and solid contaminations is expected to generate huge demand for environmental testing market in the ensuing years. Regionally, North America has been leading the worldwide environmental testing market and is anticipated to continue on the dominant position in the years to come, states the environmental testing market study. Increasing environmental issues such as acid rain, climate change, and greenhouse gas emissions is the main factor behind the dominance of the North America environmental testing market. The high number of market players being headquartered in North America is another significant factor that is supporting this regional market. In addition, enhanced safety of the population health and growing awareness about environmental safety is anticipated to drive the growth of environmental testing market in the region. Furthermore, rise in the awareness about the potential hazards of waste disposal and presence of various environmental protection agencies in the region will further contribute towards the North America environmental testing market earnings in the years to come. For instance, the Resource Conservation and Recovery Act (RCRA) is the primary law of the United States that govern the disposal of solid and hazardous waste. The Environmental Protection Agency (EPA) is responsible to develop and implement environmental regulations. EPA plans laws regarding environment protection to channel by the Congress and it has the supremacy to issue sanctions and levy fines.